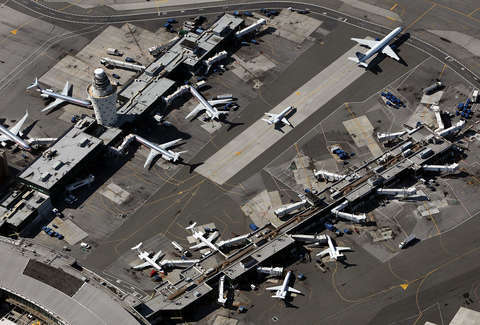 People flying in and out of several cities across the Northeast are being hit with an added travel headache Friday, as flights in and out of several major airports are being delayed due to an air traffic control staffing shortage. The Federal Aviation Administration (FAA) has cited an increase in sick leave as the cause in what appears to be the latest ripple effect of the partial government shutdown, now in its 35th day. On Friday morning, the FAA temporarily restricted flights into and out of New York's LaGuardia Airport, citing staffing shortages at air traffic control centers in Washington, DC and Jacksonville, Florida, which set off a series of flight delays across the region. The delays primarily affected travel into and out of LaGuardia, New Jersey's Newark Liberty airport, and Philadelphia airport, according to multiple reports, but delays had also spread to additional hubs such as Chicago's O'Hare and Atlanta's Hartsfield-Jackson by late this morning. "We have experienced a slight increase in sick leave at two facilities. We are mitigating the impact by augmenting staffing, rerouting traffic, and increasing spacing between aircraft when needed," the FAA said in an official statement posted on Twitter. Specifically, the FAA temporarily ordered a "ground stop" at LaGuardia, which prevented flights en route there from taking off from their departure airports. And though that order has since been lifted, delays are still widespread, with many flights' arrivals delayed an average of nearly 90 minutes, per the FAA's official website as of this writing. The FAA recommends checking with your airline for potential delays if you're flying today. This major hiccup in air travel at one of the nation's busiest airports comes just two days after the union representing air traffic controllers warned the partial government shutdown was creating serious safety issues, as the critical FAA employees have been working without pay for more than a month. Not only that, but many of them have been forced to work overtime, since staffing at air traffic control facilities is currently at 30-year low.